I am based just outside Newbury in West Berkshire and cover up to an hour from my home which spans Oxfordshire, North Hampshire, Berkshire and Wiltshire. I will usually travel within an hour of Newbury. For a map of where I cover please visit my website. I am a fully qualified Aromatherapist, Indian Head massage, Hypnotherapist and Reiki practitioner. I live with my Husband and our four children aged between 9 and 17 yrs Just outside Newbury in West Berkshire. I have a very natural ability to talk to people and love meeting new people. I believe that all women deserve a positive birth experience however birth happens. I have supported many ladies who are apprehensive or hold a fear about their upcoming birth, be it their first or their 10th baby. You deserve to feel empowered, confident and safe so I have worked hard to learn how to support couples to feel like this during birth, even when birth takes a different route to the one planned. As a doula, it is important to me to support parents during pregnancy labour and birth in the best way for each family as all families are different. My aim is to make every Mum and Dad feel empowered, comfortable and confident to make the right choices for them when it comes to their family regardless what that choice might be. I completed my initial Doula training with Developing Doulas and am a member of Doula UK and hold a CRB, Insurance and First Aid certificate. 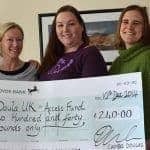 I am also a Doula UK Doula Mentor. I have attended a homeopathy during pregnancy and labour course, a Rebozo workshop and a course in Belly Binding. I am also fully qualified in several Holistic therapies, please feel free to contact me for more information.